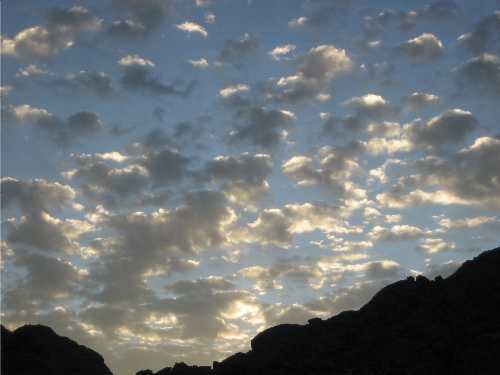 Sunrise clouds above Lac Blanc, Aiguilles Rouges, Chamonix, France. 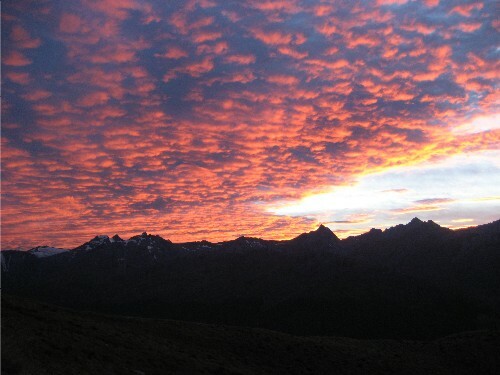 Crazy-orange sunrise clouds seen from bivouac on the way to New Zealand’s Mt. Earnslaw. Hopkins, Gerard Manley. Poems. London: Humphrey Milford, 1918; Bartleby.com, 1999. www.bartleby.com/122/. [April 29, 2010]. Yep. I broke down in Salt Lake City and spent a day sitting in a café instead of skiing while a gracious mechanic wrenched away. The problem? 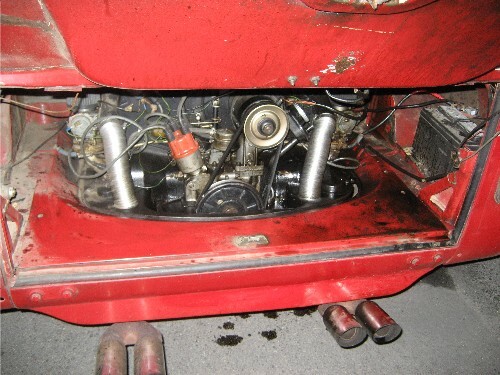 I’m still not entirely sure, but I knew it didn’t look good when I took a peak in the engine compartment after noticing several pools of oil that formed just in the time it took me to stop for gas. The engine wouldn’t turn over when I returned from inside the station, but thankfully I was within a few miles of my destination that eve, and a friend came to pick me up. 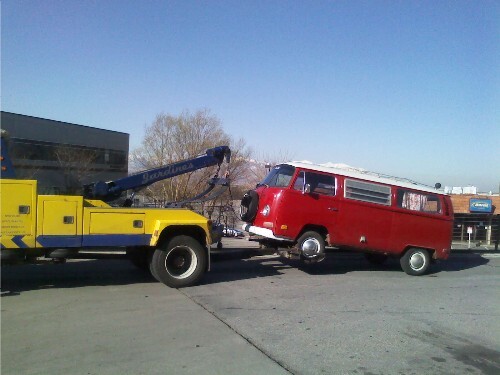 The van repairs cost what I could have spent on a plane ticket, but I didn’t regret those two weeks on the road. And I still got to ski at Brighton before returning to Colorado (bonus: free lift tickets through said friend’s cousin’s friend!). I made it back to Vail in time to ski the last few weekends on the mountain and went up on the final day to celebrate a good winter season with a bunch of other folks like me, feeling happy and nostalgic about the season’s finale. 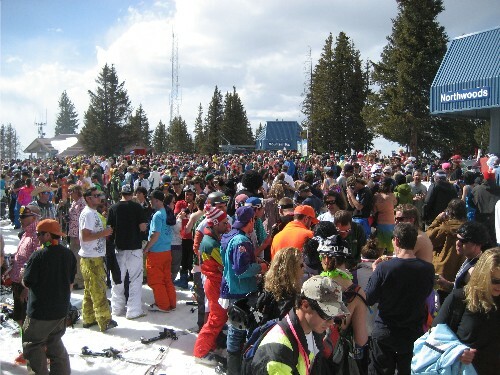 Most people skiing on the last day wear costumes and wigs, or they flash a lot of skin. I saw girls skiing in bikini tops and skirts, people dressed up as storm troopers, elves, pirates, and princesses. I stood at the top of Chair 5 (High Noon) waiting for a friend and watched them cascade from the lift. Instead of going all-out, I simply wore a pair of 80’s-inspired hot pink pants. Towards the end of the day, a gigantic crowd gathered at the top of Chair 5/Chair 4 (Northwoods) area. I stayed on the mountain and watched as Chair 5’s last empty chair came up the hill. 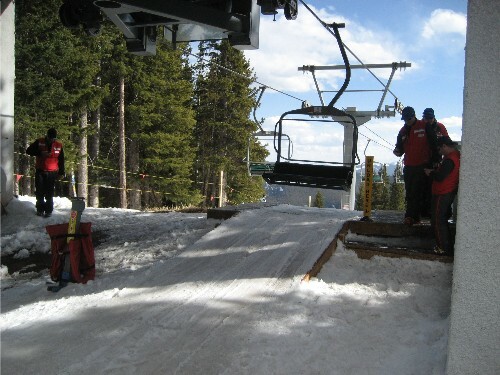 A newer, faster lift will replace this one next season, and everyone cheered when it slowed to a stop. At the same moment, ski patrol set off a bunch of explosives, which boomed like fireworks and shook the ground, adding to the already-festive air. 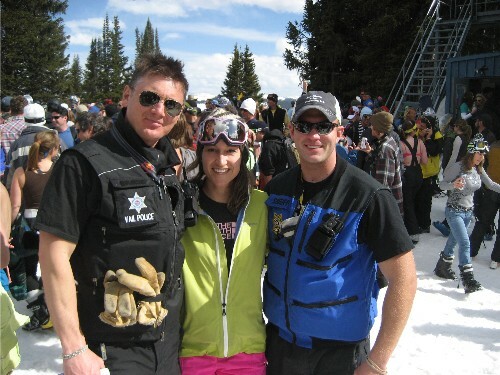 I didn’t ski back down the mountain until police and ski patrol started shooing people away. That final run off the front side was a bittersweet end to a beautiful day, a beautiful season. 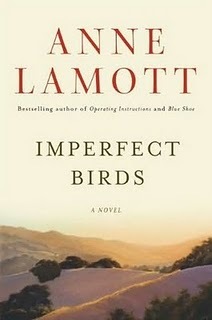 Title: Imperfect Birds // Author: Anne Lamott // Publisher: Riverhead Books // Pub. Date: April 6, 2010 // 288 p.
Anne Lamott’s new novel, Imperfect Birds, was one of the books I took along with me on my recent road trip. I’m a fan of Lamott’s nonfiction and was curious about her new book, even though I wasn’t sure I’d find its subject matter appealing. In Imperfect Birds, Lamott revisits the lives of two of her most endearing characters—Elizabeth and Rosie. Here, these two return as a mother continuing to fight for her sobriety and a teenage daughter who masterfully deceives her parents—and herself—as she cycles through the process of drug abuse, addiction, and recovery. Lamott employs her characteristically laugh-out-loud writing style to explore the consequences of teenage drug addiction, a problem that devastates hundreds of thousands of young people, families, and communities each year. Lamott’s quick-witted narrator kept me afloat as I read this book, which could have been a downer due to its subject matter. I found out in the process of reading it that I didn’t need to be a parent of teenagers or somehow otherwise be connected to teenage culture to enjoy the story. Ultimately, this novel is “about how incredibly hard it is to know and communicate the truth,” as Lamott says in an interview. And that’s something all of this book’s readers will understand. To read my full-length review of Anne Lamott’s Imperfect Birds on the About.com Contemporary Literature website, click here. 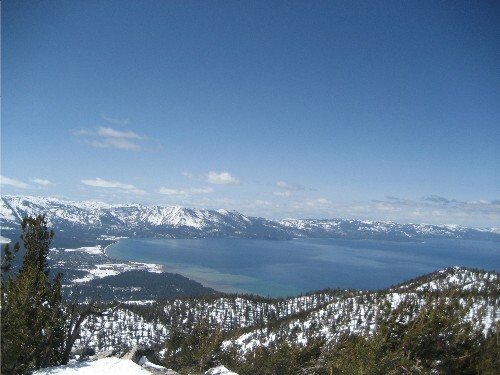 The California side definitely has the better views, but I found the slopes on that aspect to be wind-packed or icy. 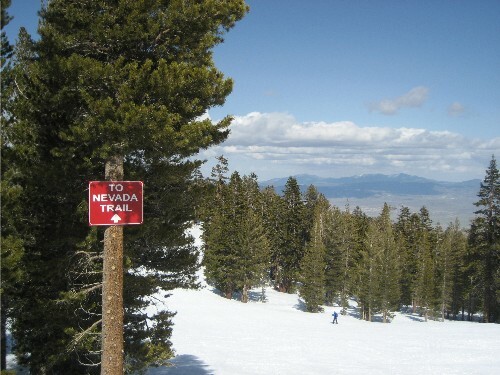 So I spent more time trying to find my way back to Nevada. On my last day, I enjoyed Mott Canyon’s slushy steeps. Of course, a foot of powder would have made it all more fantastic. With a bit of pow, this place would have some fantastic tree runs. But as it was, I can’t complain about skiing blue-sky days above a sight as amazing as Lake Tahoe with its dazzling border of snowy peaks. 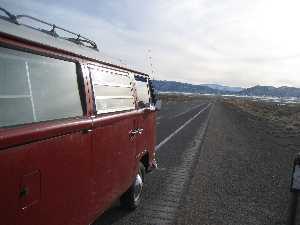 This most recent van/ski/road trip wasn’t simply about skiing and driving around in a van. 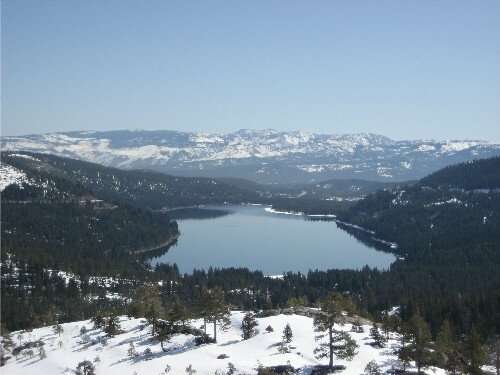 I also wanted to explore a bit of local history, specifically the history surrounding the Donner-Reed party, for whom Donner Pass and Donner Lake (below) are named. If you come to the Truckee/North Lake Tahoe area, you’ll run into the Donner name all over the place. 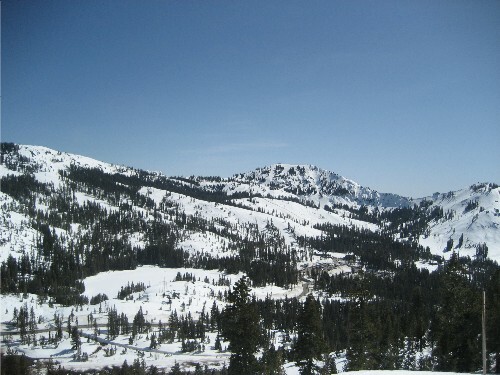 In addition to the above, there’s also the Donner Memorial State Park, Tahoe Donner Ski Area, and Donner Ski Ranch, to name a few. 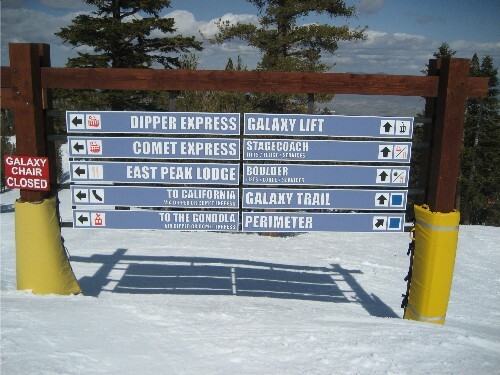 I visited all of these places, enthusiastically, but I enjoyed Donner Ski Ranch the most. 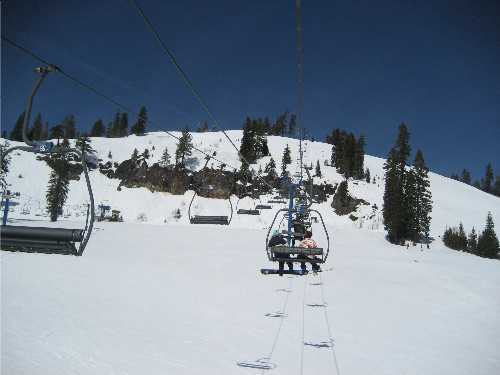 Donner Ski Ranch boasts of six ski lifts and a whopping 505 acres of terrain. When I arrived, only four lifts were running. The smallness of this place might deter some, but hear me out. 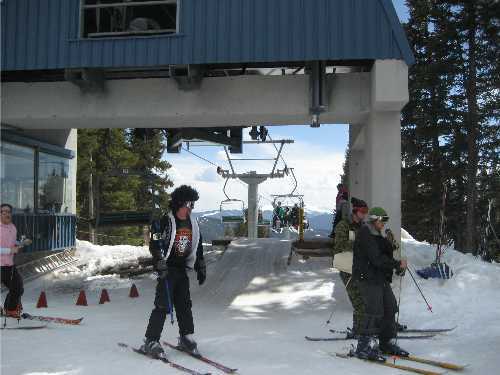 My home resort (Vail, Colorado) has more than TEN times the terrain of Donner Ski Ranch. What I realized is that when terrain is limited, the mind works overtime to pick out that next superstar line. 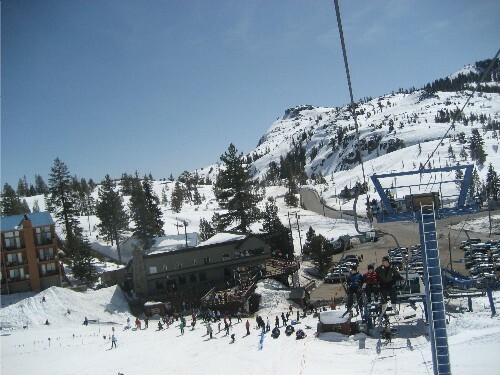 Besides, when I went into the the Donner Ski Ranch bar for a beer at lunch, I met some great locals. 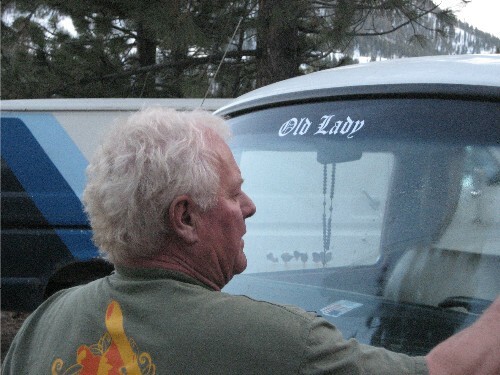 Freddog offered to let me camp behind the Donner Lake Gift Shop, which he owns and runs with his wife. 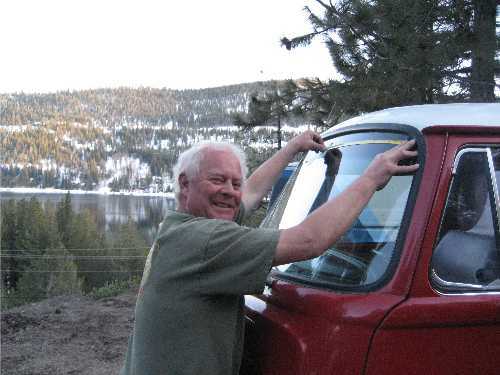 By the time I showed up to take him up on his offer, he and his wife decided me to have me over for a barbeque at their house, which overlooks Donner Lake. 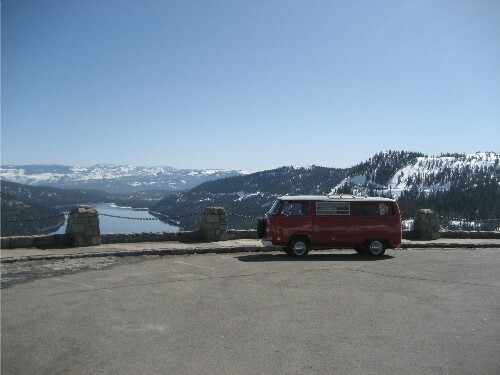 Freddog has a beautiful old split-window VW van in his garage, and he runs a graphic design business, in addition to the gift shop…and his other work in snowboarding event management. Already overwhelmed by the hospitality of these people, I was surprised when Freddog ran upstairs and printed out a little gift for me. We walked right outside and put it on the window to commemorate the Old Lady, my slow-steady traveling companion, who chugged up the mountain passes and started faithfully as I skied along Donner Trail. 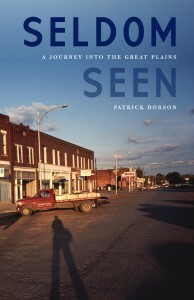 Title: Seldom Seen // Author: Patrick Dobson // Publisher: University of Nebraska Press // Pub. Date: November 2009 // 296 p.
I recently read a nonfiction book that would make Walt Whitman proud: Patrick Dobson’s Seldom Seen: A Journey into the Great Plains. In this book, Dobson takes literally Whitman’s charge to “take to the open road.” He leaves a mind-dulling job in Kansas City and walks more than fourteen hundred miles to Helena, Montana. Seldom Seen is the story of that journey, which supplies Dobson with plenty of insights about people, culture, and nature. Dobson goes beyond simply chronicling what he sees or telling about whom he meets along the way. Fourteen-hundred-miles on foot gives this writer plenty of time to process what he’s learning about the Great Plains and how it relates to his urban life back in Kansas City. And unless you live in the Great Plains, this book will take you into a landscape that’s seldom seen. Not many people flock to this area on vacation, and Wyoming happens to be the least populated state. Dobson moves through these less-traveled swaths of land with keen eyes and shares his experiences with the rest of us. People who will like this book: enduro-wakers, transient literary types, small town sleuths, nature buffs. To read my more in-depth review of Patrick Dobson’s Seldom Seen at New West, click here. 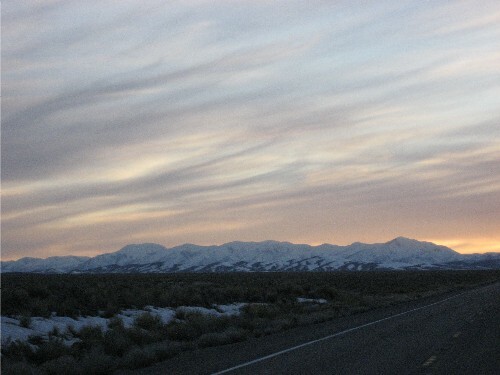 Like I said, Nevada’s Highway 50 is a desolate stretch of road, so don’t expect these images of it to be otherwise. Beautiful and lonely and blank? Yes. Much else? No, not really. Such little traffic crosses Highway 50 that I was able to jump out of my van (with it still running in the lane) to take photos. Since the van chugged so slowly through these mountain passes, I eventually abandoned the frequent photo stops and just started slowing down to take photos out the window. How lazy-American of me, right? 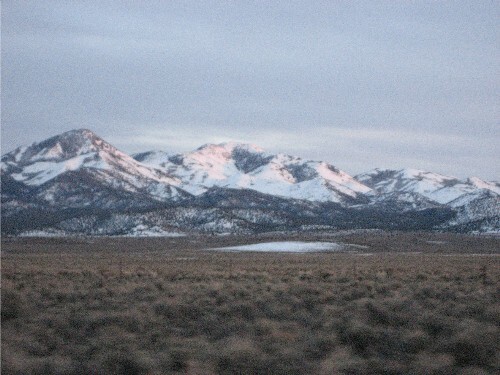 The Nevada landscape ripples with medium-sized mountains. I didn’t count, but I’m not exaggerating when I say I probably crossed between ten and fifteen passes in a single day of driving, each under 8,000 feet. Most of the peaks were still snow-covered, and the land that surrounds the mountains is desert-like—flat, dusty, shrub-covered terrain. Just west of Middlegate Station, sand replaces the shrubs, and a silver-white sheen starts to appear at the edges of land and water. 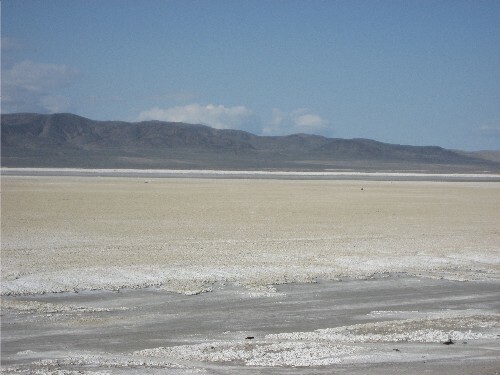 I’d never seen a salt flat before, but it was a sight I got used to in this part of Nevada, and again in Utah on my return journey through Salt Lake. I drove through this landscape for two days, feeling calmed by the roller-coaster ride of it, soothed by its pastel-painted skies.